I’ve been trying to come up with a challenge friendly breakfast that actually seems like a weekend breakfast. It seems as though the typical weekend brunch is unhealthy, but when you think about it, it’s really not. It’s all about what you put in to it, how you prepare it, and how you serve it. Take french toast for example, sure if you take a couple of slices of wonderbread, fry ’em, and then douse them in syrup they’ll be unhealthy. But if you use quality ingredients and stay away from the imitation maple syrup there is nothing wrong with a slice of french toast (or 2). To get my protein in this breakfast I had a poached egg. I’d like to thank Janice for this article on silicone egg poachers, before discovering this a poached egg would never have appeared on my plate. And this bistro egg sandwich is delicious. Whisk mashed banana, egg and milk together. The mixture will be a little clumpy because of the banana. Soak the slices of bread in the egg mixture for 2 minutes. In a frying pan, heat the coconut oil and butter till a drop of the egg mixture sizzles (otherwise the bread will just soak up all the oil). Fry the slices of bread for 2 or 3 minutes per side. Sprinkle with cinnamon and coconut sugar. The banana makes the bread very sweet, so there is no need for syrup! The bread is also very filling with all the seeds in it. I was only able to finish one slice of toast and my eggs. I only used 2 slices of bread, but there is enough egg mixture for 4. If you’re feeding a bigger crowd just increase the number of eggs. 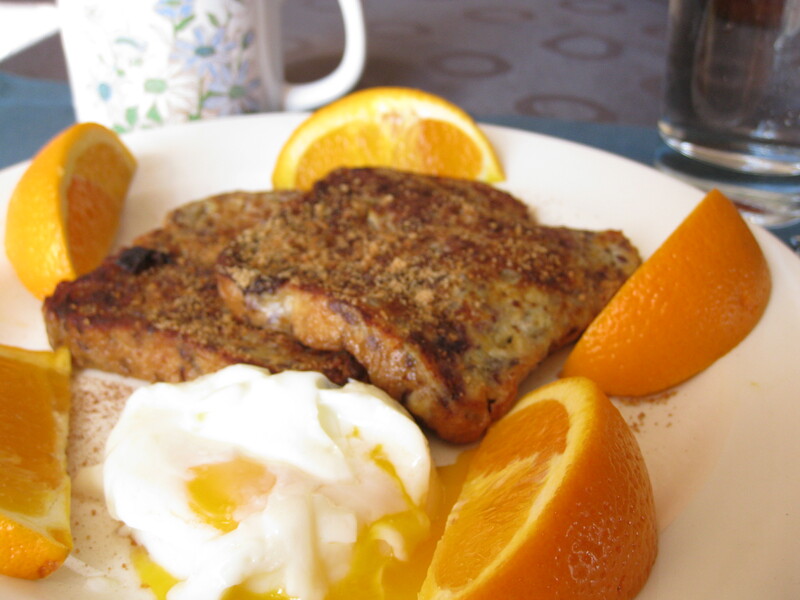 This french toast recipe sounds and looks delicious! Yum! I love that you incorporated the banana in the batter and not just scattered on top at the end! what a great breakfast!! no one seems to take the time to poach eggs anymore, I love them! This is a dream breakfast. Beautiful job. Poached eggs used to be my favorite. I seem to have forgotten about them. I must change that. I have been craving banana everything lately! Love it!